Today’s ‘Timeline Tuesday’ takes us through the 1820s – arrival of the missionaries (Protestant & Catholic,) death of Keōpūolani, Liholiho and Kamāmalu. We look at what was happening in Hawai‘i during this time period and what else was happening around the rest of the world. The 1821 Frame House at Mission Houses Historic Site and Archives was one of Hawaiʻi’s early prefab houses. They precut the lumber on the continent, then delivered it to Hawaiʻi and erected the house. It’s still there. The timbers of Maine white pine were cut and fitted in Boston in 1819 and came around the Horn on the brig Thaddeus with the Pioneer Company in April 1820, arriving first in Kona. The frame of the house arrived in Honolulu on Christmas morning of that year on board the ship Tartar. Construction of the house wasn’t necessarily smooth – it was some weeks before the King would permit its erection. Construction did not begin until April, and the frame had by that time been injured by exposure to the tropical sun. The boards for the roof could not be found, and it was concluded that they were never put aboard ship. Other lumber had been damaged enroute, and some was stolen after arrival at Honolulu. The balance had to be eked out by boards purchased locally. The Frame House was used as a communal home by many missionary families who shared it with island visitors and boarders. It is the oldest wood frame structure still standing in the Hawaiian Islands. It wasn’t until the California Gold Rush (1848) that prefab housing started to really catch on, on the West coast of the continent and elsewhere. As news spread of the discovery, thousands of prospective gold miners traveled by sea or over land to San Francisco and the surrounding area; by the end of 1849, the non-native population of the California territory was some 100,000 (compared with the pre-1848 figure of less than 1,000.) They needed places to stay. Ralph Waldo Emerson noted the gold seekers brought ‘framed houses’ with them, “Suddenly the Californian soil is spangled with a little gold-dust here and there in a mill … the news flies here and there, to New York, to Maine, to London, and an army of a hundred thousand picked volunteers”. Framed houses were also an early article of overseas trade, and before long the American colonies, in their turn, were making and shipping houses to the Caribbean sugar islands. After that both Europe and our Eastern Seaboard produced them for the settlement of Australia and California. The Polynesian notes, “A New Article in Commerce. From all parts of the world we hear that HOUSES, in perfect order to be set up in a short time, are being constructed for California. From the humble wooden tenement of a single room, to immense iron and framed buildings of three stories”. A century later, the Islands saw the proliferation of ‘pre-designed’ homes built by Harold Hicks. In 1949, Hicks brought his family to the Islands and started his own residential construction company in the laundry room of his house. One dozen efficient model home designs offered the homeowners a range of flexibility in bedrooms and bathrooms. Sizes ranged from a one-bedroom 576-SF model to a four-bedroom 1,208-SF home. 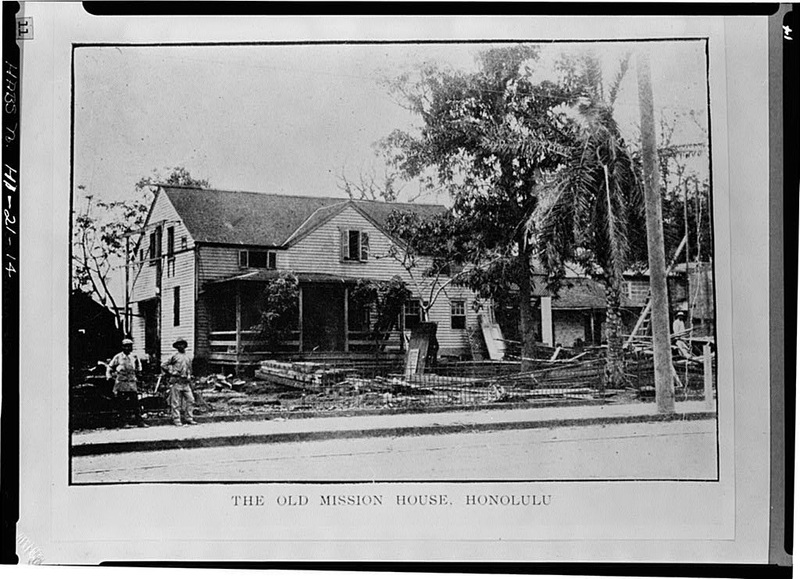 The image shows the 1821 Frame House at the Mission Houses Historic Site and Archives. (1907) In addition, I have included other related images in a folder of like name in the Photos section on my Facebook and Google+ pages.